One of Lamborghini’s most intimidating supercars, the Diablo had an 11-year production run (1990-2001) including six generation revisions. It was named after one particularly infamous fighting bull. Scalextric released the Diablo in 1990 and added a rear wing (an optional addition for the full-size car) in 1991 with the final release in 1999 being the only tooling amendment to the Scalextric car body despite many real world car revisions. This is normal in the world of toy and model cars – no need to make expensive tooling amendments if demands don’t dictate. It is very unlikely that the tooling will be used again so that fact makes the Diablo a good candidate for a concise and achievable collectable Scalextric range with a few ‘specials’ as tantalising options. The full size cars were raced in GT1, GT2, Lamborghini Supertrophy and JGTC series essentially as factory backed teams. In 1990, the Diablo was first introduced as a business-to-business incentive to boost sales in the Spanish market via Spanish wholesaler Hisinsa under Hornby’s ‘SUPERSLOT’ brand. SUPERSLOT is the name under which Scalextric was sold in Spain due to ‘SCALEXTRIC’ already being a separately owned brand name in Spain. The C360 & C361 brown and white liveries bearing the ‘Palau’ slot shop’s name, a major Spanish retailer in Barcelona, were released in Spain via the retailer and are now quite hard to find. They would from the basis of a collection quite nicely as being the only single-colour livery Diablo cars in these colours together with their standard black windowed card box with red pin-striping with individually numbered limited edition certificate inside! The first general release Scalextric Lamborghini Diablo arrived in 1991 and, confusingly, carried the reference C127 which had already been used for the McLaren M23 in 1978. (Note: C360 was also a reused number!) The 1992 release, the black Diablo, also doubled-up on the reference of C283 which had previously been used on a Rover 3500 in 1981. Why reference numbers were duplicated, a practice that still occurs to this day, is a mystery. Human error, probably! In 1991 the black C283 road car was released in Set C770 Road Racing and as a solo car and without a rear wing and then quickly followed up by another black solo version with a rear wing fitted – but still sold as C283. So, C283 has Type 1 – no wing, Type 2 rear wing versions. The winged version was thought to be a limited release at the time but has since been found to be just as common with or without a rear wing. Plain red (C411, no wing) and green (C452 with wing) versions followed. The annual Scalextric Range Presentation of 1998 saw the Diablo (C2069) used as the representation model for the year despite having been in the range for eight years. This limited availability car, only given to Hornby business account holders, was sprayed gold but due to a paint or body preparation error the paint finished soon ‘crazed’ on most examples to a lesser or greater extent. The Diablo was also produced as a clear plastic model to be part of a ‘Crystal Classics’ range which was abandoned due to lack of retail interest. This interesting model allowed all internal parts of the car to be seen. Having the appearance of glass crystal the intention was that it would be more of a decorative retail item aimed at high-street stores selling presents and cards, etc. There were also clear cars for the Brooklands slot-car swap meets and Barry Potter Auctions. 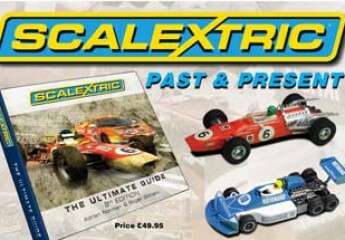 They were available with or without lights but as they were not released in commercial quantities they were not assigned official ‘C’ references – though I have assigned references in the Scalextric Ultimate Guide book to help in recording these and similar such releases. Due to the lack of real world Diablo race cars most of the Scalextric range is dedicated to road liveries and ‘event’ cars and just three pseudo-race liveries. Part of the licensing requirements from companies such as Lamborghini is that they do their utmost to protect their brand image. A privately owned Lamborghini race car is of little importance to Lamborghini’s branding department so their main focus is on encouraging a model/toy manufacturer to make a car that represents their official factory cars. That is why most Lamborghini Scalextric models simply reflect their standard house colours of orange, green and yellow. Other colours take a distinct back seat. Liveries bearing the raging bull outline or the letters ‘SV’ (one of their models) make regular appearances throughout the range of Lamborghini in addition to the Diablo model. Special one-off liveries have appeared over the years such as a Police car with working flashing roof light but was never released. Brand tie-ups with Premier League football were launched with a range of Ferrari F40 ‘football’ cars. In the initial stages a range of test liveries were created and offered to the respective licence holders. Some were supplanted on to the Diablo and a Manchester United and an Aston Villa decorated car have been recorded. Neither were released as part of the football range and therefore are rather collectable. Another football connection may have been considered with a Brazilian CBF decorated football liveried Diablo. It’s only one more step to another Brazilian connection with a range of cars, not just Lamborghini, celebrating F1 World Champion Senna. Chromed cars used as official competition road show prizes exist as do various coloured body shells. These are always very rare with only a handful or single examples known to exist. Examples of the engineering process in adding the rear wing to the car also exist. Some body samples, usually in different shades of green, exist that show round pin holes for the planned rear wing. However, the design was changed at some stage before production so that the rear wing slotted in to larger, stronger rectangular slots. The ‘Senna’ collection range included Audi A4 touring car, Williams F1 car, Subaru Impreza rally car and the Lamborghini Diablo. This brand tie-up worked well and saw two Diablo cars in blue/white (F2223) and yellow/green (F2224) liveries as solo cars and a Set F1037 GT Championship. This range of Senna items were all prefixed with ‘F’ rather than ‘C’. I believe the ‘F’ should have been a suffix, not a prefix, and so should have been C2223F, etc. These solo Diablo cars are packaged in a plastic base, crystal box lid and card sleeve fully branded with SENNA graphics. Variety; plain road livery, race livery, chrome, with and without lights, football, police, clear, licensed, dual-branded solo cars and Sets. Something for everyone! Lamborghini has a tradition of naming its cars after breeds of fighting bulls. The Diablo was named after a ferocious bull raised by the Duke of Veragua in the 19th century, famous for fighting an epic battle with ‘El Chicorro’ in Madrid on 11 July 1869. In this day and age it is not necessary to go to such lengths in achieving such a collection but to be the conquistador of this herd of bulls would still be quite a challenge but a devil of a collection. C582 not released in black. C582 not released. Originallyy intended for Pacer set. If you believe you have a yet unrecorded variant and seek confirmation of its authenticity, please contact me at slotcarportal.com.